Arguments over what can be divulged in confidential closed-door meetings have been a crucial part of the split between Mayor David Condon and City Council President Ben Stuckart. But if they repair that rift, that might be in a secret meeting, too. It's not just the answers you get that matter. It's the questions you ask. As Mayor David Condon and the city's legal team prepares to meet behind closed doors with City Council President Ben Stuckart to discuss the city's legal strategy for defending itself against former Police Chief Frank Straub's lawsuit, a crucial question — how ironclad is the privacy of those meetings? — hangs in the air. It's a question state Rep. Marcus Riccelli has asked the attorney general to weigh in on. And it was this question, as I lay out in an article this week, that started driving the wedge between the mayor and the city council president on the independent Straub scandal investigation. Behind the scenes, this argument has continued. Records obtained by the Inlander reveal that, earlier this year, Assistant City Attorney Mike Piccolo reached out to the Municipal Research and Services Center (MRSC), a non-profit that provides legal and policy guidance to local governments in Washington state, asking whether councilmembers who violated the secrecy of executive sessions could be punished. In Washington state, many city meetings are legally mandated to occur in front of the public. But there are a few exceptions. Cities can kick out all the reporters and members of the public during meetings in order to go into confidential "executive sessions," to discuss pending litigation, or real-estate deals, or personnel matters like, say, the forced resignation of a police chief. In a manner similar to Fight Club, you don't talk about what happens in executive session. Piccolo wanted to know if the state law punishing councilmembers who willfully neglected their duties would "apply to a councilmember who willfully discloses confidential information." Dalton's letter angered Stuckart, who decried it as a threat. He says he paid $4,000 to his lawyer to ensure he was legally protected when discussing the meeting with the investigator. Two months later, the MRSC sends out a newsletter to its members answering a similar question, suggesting "a city councilmember who willfully and unlawfully discloses confidential information gained through an executive session" could face gross misdemeanor charges. But the city council pointed out that that wasn't the question at issue. The question was whether that confidentiality could be waived by the council. On April 22nd, Piccolo e-mailed MRSC legal manager Joe Levan to see if the council could vote to waive closed-door-session confidentiality. "The Council wanted me to check with MRSC to see if there was an analysis regarding whether a majority vote of the Council waiving a particular executive session's contents makes the subsequent disclosure of the waived material lawful, thus not subject to these provisions. Immediately after, City Attorney Nancy Isserlis shot off an email to give Levan a sense of just how serious the situation was: "And another important fact," Isserlis wrote, "Executive session was convened to discuss the performance of a public employee." In a conversation with the Inlander, Levan says that Piccolo's follow-up question isn't unusual. He didn't know of court decisions that addressed the questions specifically, but he says that "MRSC has said in the past that generally it would seem that a council could, by a majority vote, the council could choose to waive confidentiality." He defers, however, to the expertise of the city attorney's office "in the trenches." "There's nothing specific in state law that addresses this issue. But, since the council controls what happens in its meetings (including whether or not to hold an executive session... ), we’ve consistently concluded that a council may vote to waive the confidentiality of a specific executive session. I think that such a waiver could be done by a simple majority vote of the council in an open public meeting." In other words, the experts at MRSC came to a quite different conclusion than the city's legal staff had. However, we’ve previously recommended that such a waiver be done by unanimous vote only. Otherwise, it could be unfair to decide by majority vote after the executive session is over to waive its confidentiality when councilmembers may have made statements they expected would remain confidential. Specifically, it could have a chilling effect on future discussions in executive session if a simple majority could waive the confidentiality of an executive session. It was something to consider, McClatchey wrote. "The recommendation about unanimity on lifting confidentiality of executive session information is a very good one, and I think I will propose that change to the Spokane Municipal Code to make that clear," McClatchey wrote back. But Stuckart hasn't exactly leaped at that suggestion. "I think the majority is always fine for most decisions," Stuckart says. "I don't think requiring a supermajority for taxes is necessary — it shouldn't require little more than a majority for releasing information." Breean Beggs, true to form, suggests a compromise somewhere in the middle. "My own sense, in terms of constitutional separation of powers, it probably should be a supermajority, not unanimous," he says. Waiving confidentiality is a serious thing, but he wouldn't want to give just a single councilmember the power block the rest. But Beggs points out a problem. It only takes a simple majority to change council rules. Even if waiving the secrecy of executive session did require a supermajority, all the council would have to do is to change the rules back to a simple majority if it didn't quite have a vote. Stuckart, for his part, says he's not worried that waiving executive session once would make people less likely to speak freely in future sessions. "We've waived it once in four and a half years," he says. And that, he says, was because somebody lied to the council. 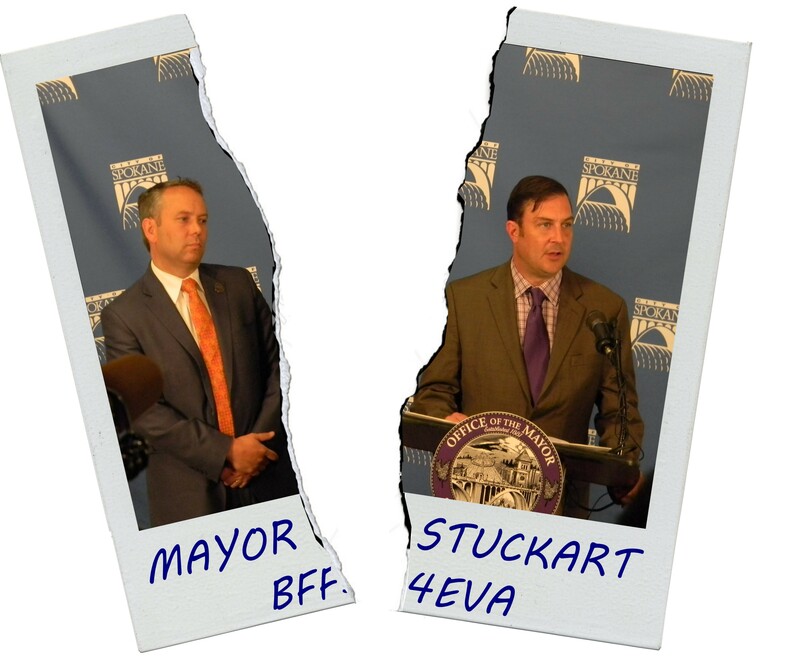 Last week, however, Stuckart did take the risk to discuss something in executive session, and without taking a council vote. In an interview with the Inlander, Stuckart claimed that the mayor, during an executive session, had suggested either folding the independent investigation into the defense of the Straub lawsuit, or tasking attorney Dennis Hession, currently overseeing the Straub lawsuit defense, to oversee Cappel. Stuckart thought those were both terrible ideas, a blatant conflict of interest. But he says he was allowed to do that, because the mayor had already brought up the confidential discussions matter in his public letter to Stuckart: "Earlier this year, [Stuckart] declined at least two offers to move this process forward by appointing special counsel to oversee the investigation," the mayor wrote. "Once he discusses what was discussed in executive session, he has waived privilege on that topic," Stuckart says. Marlene Feist, a city spokeswoman, didn't see it that way, suggesting that the mayor was limited from discussing the matter further, because, well, it was made in executive session. She said the mayor was just discussing the topic of the meeting, not the details. Stuckart still believes he's legally protected, and says he hasn't heard any pushback from the city over his decision to discuss it. After his conversation with the Inlander, however, he did give his attorneys a heads up. "I called up my legal counsel to let him know," Stuckart says.